To find out whether you are a good candidate for this procedure, call our clinic and schedule an appointment to learn about all your options for gaining a healthy smile. Usually this procedure takes place in only one visit, ranging from 30 minutes to an hour. Our dentist will determine whether you are a good candidate for this procedure. 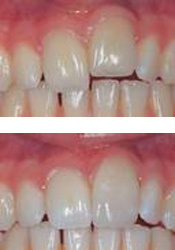 If you are, you will be amazed at what can be done to improve your smile in very little time, reasonably and comfortably! Contact us today to schedule an evaluation to determine whether you can benefit from our contouring procedure!